pre-Civil War days in smuggling slaves to Canada. Leader of the enterprise was Buddell Sleeper. 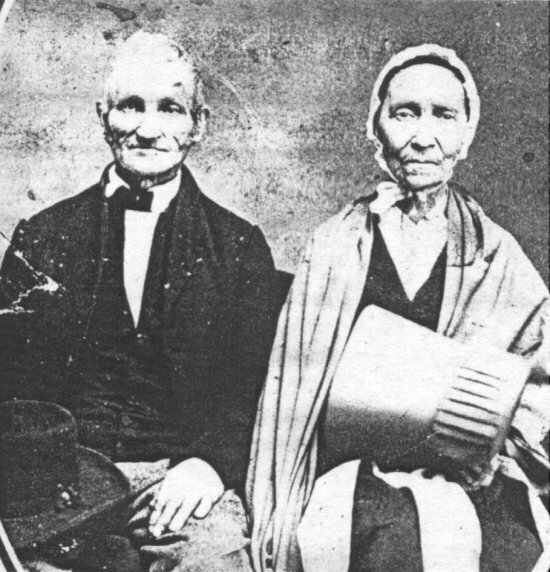 Buddell Sleeper, one of the prominent pioneers of Tippecanoe County, was a native of New York, born in Otsego County, July 29, 1806, a son of Samuel and Patience (Burroughs) Sleeper. His parents were born near Philadelphia, Pennsylvania; and in their youth they accompanied their parents to Ostego County, New York, where they were later married. To this union were born nine children; five boys and four girls, of whom Buddell was the next youngest child. In 1810, they left New York and moved to Northampton County, Pennsylvania, where they lived seven years. They then moved to Clarke County, Ohio, where our subject grew to manhood. Buddell received only limited advantages for obtaining an education. He attended, when a child, the subscription schools; but by studying at home in his leisure hours, he became well informed on general topics and acquired a fair business education. When he was twelve years old, he began working on the farm and was thus employed in addition to working at the carpenter's trade, until manhood. He was married January 2, 1833, to Elizabeth (Hendricks) Welch, who was born in North Carolina, July 22, 1802, a daughter of Samuel and Chloe (Hendricks)Welch who had moved to Ohio in 1815, locating in Warren County. Buddell and his wife remained in Ohio two years, and during this time, their eldest daughter, Martha, was born. In the autumn of 1835, he and his brother, Jacob, and brother-in-law, Seth Williams, removed with their families to Tippecanoe County. Buddell settled upon a farm near Farmers Institute, where the remainder of his active life was spent. After settling in Indiana, Buddell and his brother, Jacob, together bought 1100 acres of land paying $4 an acre. 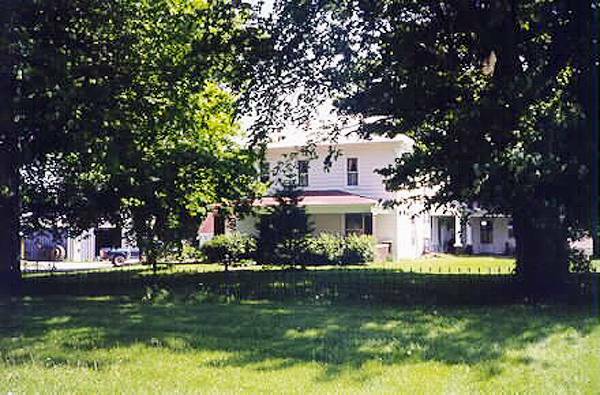 He added to his original purchase until his homestead contained 400 acres of improved land. He was also owner of about 700 acres in other tracts and about 1000 acres of improved land in Mahaska County, Iowa. His property was acquired by hard work and good management. He always paid cash for his land, never giving his note for any of it. He was a great reader, and lover of plants and animals. In his well-kept garden were many rare and beautiful old-fashioned flowers. He enjoyed telling the grandchildren of beavers, muskrats, wolves and bears that he had trapped in his earlier days. A big bear trap and other traps in his work shop evidenced the truth of his stories. 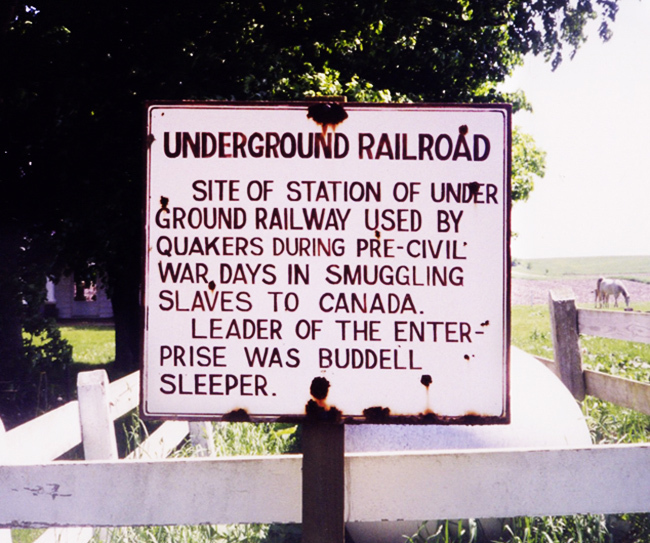 In the pre-civil war days, Buddell was the leader in the enterprise known as the Underground Railroad. Many fleeing slaves from the South were secreted in his home and taken on to the North in the dark hours of night, to freedom. This night work was often the duty of Isaiah Sleeper who made his home at Buddell Sleeper's. Buddell Sleeper and his wife, Elizabeth, were birthright Friends. They sat at the head of the meeting: Buddell on the men's side; Elizabeth, on the women's. They were of the old conservative stock, wore the plain clothes, and spoke the plain language; but they were reasonable and agreeable in allowing the younger generation to adopt new costumes. They were active in the growth of the church and were the first to organize a Scripture School and foremost in promoting a school for higher education. 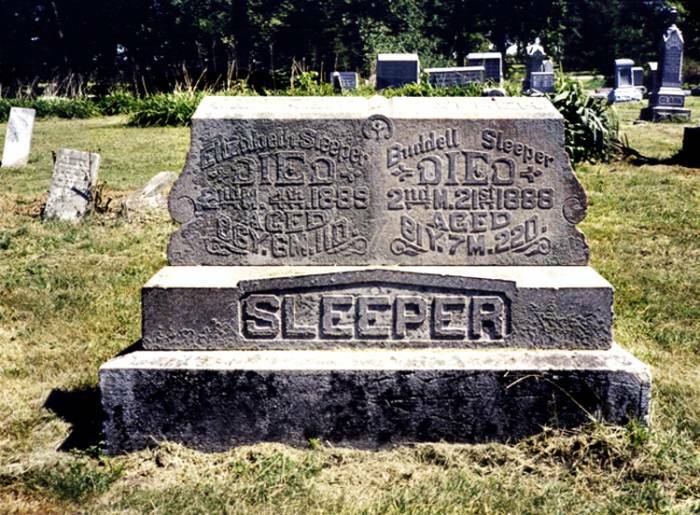 The death of Buddell Sleeper occurred February 21, 1888, aged 81 yrs. and 6 months; and the death of his wife, Elizabeth, February 4, 1889, aged 86 years and 5 months.